What is the Meaning of the Tau? The last letter of the Hebrew alphabet is the tau, which was transcribed as a “T” in ancient Greek. Many early Christians used this shape as a crucifix when honoring the sacrificial death of Christ. Ancient texts about Roman crosses describe them as consisting of two pieces. The upright piece (“stipes”) was fixed in the ground, often permanently. The horizontal piece (the “patibulum”) weighed about a hundred pounds or so. The condemned person was usually forced to carry it to the place of execution. Our pictures and statues of crucifixes today usually show the two pieces mortised into each other in the † shape. More probably, the Roman army carpenters didn’t bother with such time-consuming joinery, because there were too many to build. They would have simply hammered a peg into the top of the stipes and bored a hole in the patibulum for easy assembly, forming the cross in a single motion — in the shape of the letter tau. 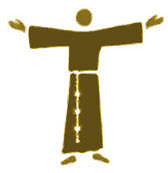 Saint Francis began wearing this symbol of Christ’s crucifixion while caring for lepers with the religious followers of St. Anthony the Hermit, who used it for protection. 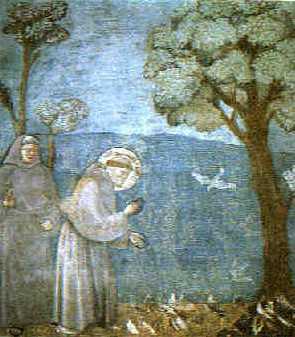 Saint Francis eventually adopted the Tau for his own crest and signature. For him, the “T” represented a life-long commitment to living the Passion of Christ. 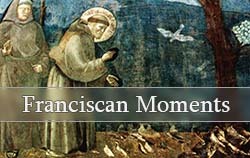 To drive home this point to his friars, Saint Francis stretched out his arms and proclaimed to his friars that their religious habit was the Tau cross. The posture that forms this cross shows that we are open to the needs of others, that we love them and welcome all. Sometimes this openness leads to more suffering, and this is how we live the Passion of Christ. This is how we become more effective in leading others to heaven with Christ, for all our Good Fridays eventually lead to Resurrection Sundays.